Six years of family caregiving taught me a lot, not least the power of good people working together as a team. This diagram shows a person living in their own home, supported by a family member/advocate, then supported by a whole community of people doing all the jobs needed to keep someone well in their own home. This diagram mirrors my own experience, the strange thing is that not all the team(s) knew each other. They never got together as one whole group and they didn’t know all the other teams that existed. They definitely didn’t all exchange information and they may or may not have had the right information at any point. But whenever they met me/or called me on the phone they could connect to the team, check what the latest information/status was and support accordingly – they were my Dad’s care team. This was my challenge for six years – being the person that enabled carer/service teams to get the right information at the right time; being the person that bridged all the different people in the team so that insights could be shared and the right care could be delivered and planned for at each intervention/meeting/exchange point in the six year journey. So what am I thinking about this #carersweek 18 months after my carer role finished? I’m thinking the job was too much… but that I would do the same again if the need arose for someone I loved – that’s just what you do isn’t it? I knew what I needed as a working family carer but existing services didn’t seem to link up. I needed to know someone who knew the care field and if there was anything/anyone/any service to help. Thankfully for me the third sector were there to help support. I cannot thank Carers Leeds and the Alzheimers Society enough, I don’t know what I would have done without them. I’m really thankful that #carersweek exists and we can all just stop for a minute and maybe consider… what is a carer? …what’s it really like being a carer? …will I ever be a carer? For me care is a precious thing both to receive and maybe even more so to give – I learned so much thanks in part to those who joined me on my carer journey. I’d just like to say to all our team again… Thank you! We discussed the importance of not reinventing the wheel and quickly brainstormed similar innovations across the country and elsewhere in the city. The Dementia Centre at Stirling University was quickly put on our list of places that may be able to share and inspire some good thinking. We had some dementia carer knowledge in the room already and experiences were shared. We highlighted the need to see how current initiatives are doing… eg. Memory Support Workers Team, Carers Leeds, Memory Nurse teams, Alzheimer’s Society and find out what their current challenges and needs might be. We knew of different initiatives like the Dementia Friendly performances and workshops at WYPlayhouse and the Dementia Friends training, different reminiscence projects and companies like Premier Private Hire making their services dementia friendly. We highlighted: the need to make spaces accessible for people with dementia and not stressful, disorientating places; the importance of colour/contrast, good lighting, non-reflective surfaces; dementia friendly interior design and making the spaces friendly and approachable in terms of people and atmosphere. We discussed the currently existing services and support already available online and through apps and how we can utilise them… not everything has to be dependent on a building. So what can we do before the building? How we can use and start making more use of the online digital spaces like twitter, facebook and the internet. We mentioned the opportunity to work in the ‘open’ arena and look at ODILeeds approach to innovation and the work of GDS Government Digital Service especially their digital design principles. This was a new descriptor to me, but basicly it meant defining the groups remit, areas of focus and it’s why. This is something that is being collaborated on and the group are all feeding back on an initial proposal. The group all gave their time voluntarily today, but we looked at where funding might come from in the future to enable work that we might pursue in the future. It was clear that the digital opportunities may be a little more easier to fund with mHabitat and Leeds Beckett both pointing towards funding routes through them. So why am I giving my time to this and blogging about it? Having been a family dementia carer for 6 years and having managed to keep my father in his own home for that whole period I know how much work it takes to make it work, (lots of gaps between services for families to fill). It seems to be a generally held experience by others too that this pressure on families is too much and could be relieved significantly with innovations that digital can bring… giving new ways of working and communicating for services, community and families effected by the condition. The elephant in the room is that some people diagnosed with dementia go into care homes too quickly causing them unnecessary stress, people are not always supported adequately to optimise the life that they could have, very positively living with dementia. This is going to take a lot of group effort… but there are a growing number of services in Leeds who are ‘on it’. I look forward to embracing the ‘open’ agenda and seeing how this all moves forward. The need to improve dementia services is too great to keep it to ourselves… please get in touch if you are interested/would like to ask any questions. I work for the Stick People as a service design and innovation consultant. It’s coming up to a year since my Dad died. I am about to move back into the old family home. The past year has been tumultuous as I have steadily worked through all the jobs and challenges that follow the death of someone who had Alzheimer’s for the last stage of their life, but had a daughter who enabled them to stay in their own home (with a whole lifetime of clutter/treasures). I’m in a process of change that means the re-unification of what became two lives, back into one. Caring for someone with dementia can mean that you yourself are lost in the many demands that your loved one makes, both consciously and increasingly unconsciously as their condition progresses. Thankfully I was well advised to keep a place of my own so that I had a place of rescue and a place to hold me safe in the whirling dervish of dementia care. This place is now going to be handed to someone else, a lovely rented flat. I am now going to move into the house that was my original home… it is an interesting move and not easy some may say. But it is the move I wanted and my Dad wanted for me too. It is a place of new beginnings… a new start, whilst still reminding me of good memories of old. There’s lots of work to do, but I’m kind of used to that now. I wanted to make a simple recording of this final step in my dementia carer journey… no longer keeping two houses, two lives two care plans going, but returning back to one. It’s going to feel a bit strange for a while, but I’m sure I’ll get used to it. Just one last question… Do I get a badge? Leeds have just recruited 14 Memory Support Workers to support people with dementia and their carers across the city. This week they started their team training and I was invited to go along to share my recent experience of being a family dementia carer – someone they might meet when the job starts. We packed into a small room but there is no small ambition for this group – these people will make a difference to future dementia care planning and help enable anyone who gets a diagnosis of dementia to find the right information for them and enable positive good choices as they plan their future. My brief was to shed light on what it has been like to go through the dementia carer experience in the past six years. I had agreed to share the story as a thank you, to the current and previous services that have been doing the job up until now… and I hope, to help inform future services as new initiatives develop. The team all introduced themselves to me individually, which was a great start – it’s always easier to do a talk when you know who you are speaking to. I heard #NHS #LYPFT #OT #Homecare #AlzheimersSociety #DegreeinDementiaStudies #Psychology and more… but it was very clear that we have a diverse group of people who together will make a great team – there’s definitely potential for a 1+1=3 outcome. I delivered my talk to a very eager audience… the most engaged yet. As I showed the old booklets and leaflets that I had received, the new team quickly retorted with – “here’s the new material you’d get today” (so I look forward to digesting those two booklets – thankyou!). The questions and comments I received filled me with huge confidence that there’s a lot of knowledge in this team and an eagerness to share and support each other. (You don’t see this picture when you are a carer outside the ‘system’ but in the home caring for your loved one.) I invited anyone who wanted to connect to me at @wecaredesign on twitter – the place where I got most info and connected most regularly to support in the UK and around the world – I already have two followers, so that’s a start. I really want to use my experiences to benefit others and help inspire future services. When I first found out Dad had dementia, I wished that I’d been able to contact other people who had already been through the experience for their wisdom… this proved impossible locally as I was working full-time and most support groups met during working hours. I did find cosupport eventually, but not in Leeds but in the Highlands of Scotland via Twitter, where a guy was caring for his mother and tweeted back to my questions in the early twitter days (before services and charities arrived). This isn’t the experience of a lot of carers because they are either not working and or not really happy with online communications. But I hear the number of ‘working carers’ is going to increase and we will have a sandwich generation where families have to look after their own children as well as their parents at the same time… so the wider the network of know-how in the city the better, and for some that will be online. I didn’t deliver my talk on Digital Tools for Dementia this time, but there seemed to be some interest. This team are going to deal with lots of different kinds of people in all kinds of situations and from all kinds of backgrounds – Leeds is such a diverse place on so many levels. 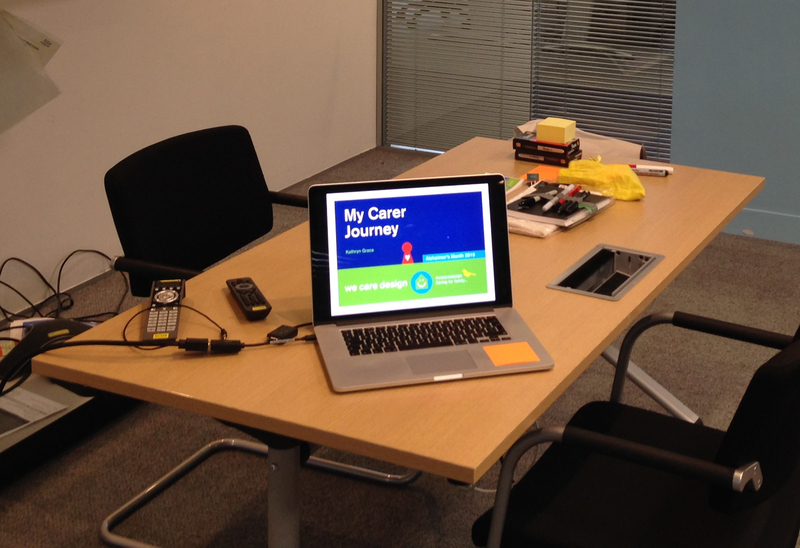 I was just one carer in a haystack – but one who brought a design/problem solving outlook, ‘working carer’ challenges and ‘digital and social solutions’ to the forefront – lots of food for thought. Working carers and digital savvy carers are not yet ‘typical’ in today’s dementia patient and carer community – but people’s expectations are steadily changing. I’m looking forward to connecting with the group and sharing more insights over time and maybe even collaborating at some point again – they all have my email, so all I can say is ‘watch this space’. Something tells me dementia care might be slightly less scary with this team around… Good Luck! and thank you for including me in your training sessions at the beginning of this new service. If you are already online and want to connect to this group – the twitter account is @AlzSocLeeds and if you are a carer you can also follow @CarersLeeds where a wide range of carer support can be found. 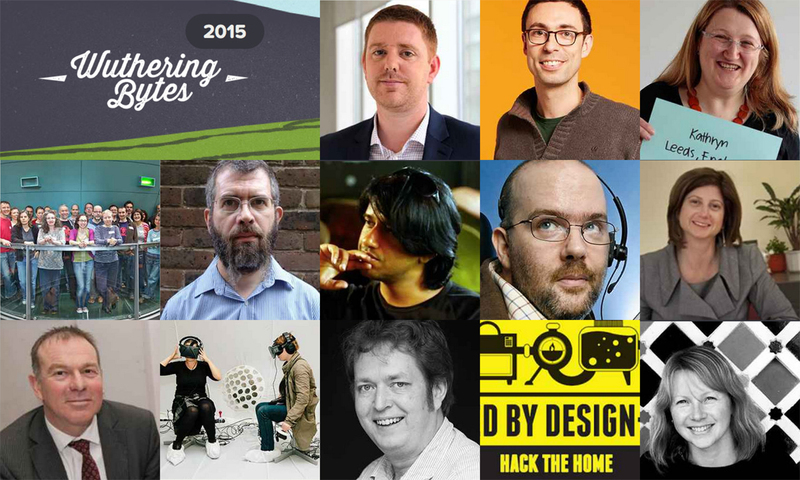 Last week I headed up to Hebden Bridge to speak at the Wuthering Bytes Tomorrow’s People Day. I was speaking on ‘Digital Tools for Dementia’, to an audience of public sector, private sector, digital and non-digital service commisioners/providers/creators. Some great perspectives on our new smart cities world, stories of innovation and new initiatives were shared, showing an aspiration to really make digital work to help solve problems and enable us in our daily lives, whoever we are. Tim Griggs from Arup started us off with the keynote piece – ‘good design is democratic’ quoting Ove Arup whose vision still shines today. Raising the importance of getting citizens involved in ‘smart city design’ – political, economic and social aspects and less focus on technology – we need ‘smart’ outcomes. Elaine James from Calderdale Council shared the results of the Hack the Home event September 2014, where working with Enabled by Design, FutureGov, University of Leeds local people with disabilities/special needs, local innovators/designers and local disability support services, a day of person centred design was enabled. Getting all those elements together was no small task and the day was a great example of how collaboration, coproduction and people centred design can create completely new ideas/thinking/solutions to problems that seemed too difficult to solve. Stuart Turner was not able to attend in person, but by the power of technology delivered his talk on screen over WiFi. His view of the world showed how much can be done, when you have open networks, open platforms, open thinking, open design, the right skills, know how and insights into what is really needed. As a quadriplegic he has broken boundaries over and over again… he made us all rethink how we design and even think about what can and can’t be done with technology. He challenged people’s lack of expectation of people who happen to have a disability and what people think they can/cannot do – ‘this needs to change’. Erica Purvis then shared the story of ‘Open Source Circular Economy’ and OSCE Days another form of collaboration bringing people together from all over the world to work on projects together or alongside each other. The global view she shared showed how we don’t have to rely on the skills in our local neighbourhoods/networks, we can open our thinking and conversations far wider than in previous generations using social media and digital collaboration platforms. Paul Butcher from Calderdale Council shared the real need for innovation in local communities, needing to address the problems and challenges of isolation, especially for older people – loneliness and social isolation. He gave examples like Casserole Club where technology and people centred design/thinking are used to bring people together – people who can cook with people who need a meal in the local area. The result is not just practical in that people get a meal who need it, but they also get social interaction too, which helps with feelings of well being for everyone. Other speakers Damon Hart Davis, Imran Ali, Esko Reinikainen and others broadened the view still further and the common goal of the day seemed to be how we can make technology more human and how we can use technology more effectively to help with our everyday lives – meeting our needs. So when I got up to speak it was quite a different audience than I’d previously been used to – far more diverse and potentially challenging. It’s tricky to wear two hats at the same time – Service Design and Dementia, people are used to wearing just one. Seeing dementia through a ‘digital technology’ perspective helps normalise quite a challenging subject… ‘Aah! I’d never thought of using Skype or YouTube like that’. Applying very familiar and well used technology to the older people or dementia care environment has a great almost disproportionate effect on users/person being cared for. It’s not the technology that people are particularly wowed by, but the connection to something that is meaningful to them, that they thought they had lost eg. old favourite music/films/photographs/maps of meaningful places where you’ve spent your life. Technology can reconnect people and enable a sense of well being. This can effect the person with dementia but also the carer too as they get a glimpse of the person they know well, that had become hidden. I found that a number of people at the event came up to me after my talk. A number were quite personally effected and could say ‘my Gran…’ or ‘my Grandad…’ or ‘my Mum… has dementia or has just been diagnosed’. It seemed like a line was crossed to bring this ‘home challenge’ that people had very personal experience of, into the world of ‘tech’ and ‘innovation’. By having this talk in the middle of other talks with wider technology thinking helped build awareness – and interestingly proceeding speakers were able to add a little older person/dementia care thought into their presentations proving the value of such a diverse day. The aim of Calderdale Council and it’s health and well being/digital champions CEO Merran McRae, Michelle Veasey, Elaine James and Paul Butcher was to use digital technology and people centred design interventions to solve real problems in their local area… a challenge all local councils across the UK share. The Wuthering Bytes Tomorrow’s People part of the event (part of Calderdale Council’s Tech Future programme) certainly delivered on that aim… we all came away from the event with new connections, more informed and very inspired. A special thank you to Michelle Veasey for being so inclusive, welcoming and understanding. It was great to take part in such a great future facing event. If you attended the talk/read this blog and would appreciate some support, the Carers Trust or the Alzheimer’s Society is a good place to start to find your local support network in the UK. Dementia Friends does a great job of building understanding and awareness if you’d like to know more. It’s now over a week since I attended the Leeds Dementia Board to share my story as a working carer and to hear the journey of other carers looking after family members with different forms and stages of dementia. So I think enough time has passed by to now make sense of what I heard and what I learned. I was invited to the Leeds Dementia Board – ‘Carers Takeover’ by Tim Sanders the lead on Dementia for Adult Social Care at Leeds City Council. I was really chuffed to be invited and be able to share my story with another key audience in the city. There are many people rooting for the improvement of the carers experience in Leeds and it was quite nerve racking to meet them. I was one of six carers sharing stories that day and it became very clear how different the carer experience could be. You can be a husband/wife, daughter/son… you can live with the person, you can live near by and help from home or you can be working full-time and juggling the everyday challenges and tasks of dementia care. The one thing that was very loud in the room was just how much the carers loved their relatives. I’ve had a number of discussions about this, most recently at the weekly twitter chat #AlzChat (8pm Mondays) and our conclusions were that loving your relative or person you are caring for is a key resource on the journey. If there is one good thing on the carer journey it is ‘realising that love’ both in the work you do and the moments you share of just being together and enjoying each other’s company. When you love, you don’t give up, you keep fighting, you try to understand to make life as good as possible. The carers shared another experience and that was being driven (far) beyond their personal limits of energy, resourcefulness and understanding either of the condition you were managing or the dementia service support ‘systems’ you were left to navigate often in a crisis and annoyingly, too often alone. One carer shared their experience of having had 30 years of experience looking after a relative with special needs, and them having a care support worker… every other carer in the room gasped. ‘What is a Care Support Worker?’ It isn’t that carer support is not out there at the moment, but that it is not an automatic given, when you become a carer. But this carer with 30 years experience was left aghast… coming to terms with a totally different kind of care, more searching, more painful, more confusing than their previous experience. I shared my story of having been an information junky after my Dad’s diagnosis, using my research skills and internet know-how to get the information and find the human support I needed to look after my Dad and at the same time look after me. It was quite a shock to me that not everyone has those skills and not everyone can access the information I had either because they were not online or they were working or they just didn’t know there was any help out there. Noone is born with the skills to be a carer and particularly a family dementia carer… but there are really helpful skills, tools and mindsets that can be shared and learned. I now realise how incredibly lucky I was to catch the Leeds Dementia Diagnosis system when I did in June 2009, sadly not still in place. I was given support in the form of a Memory Nurse for Dad; an Alzheimer’s Carers support worker for me, to come to terms with Alzheimer’s diagnosis, care and planning; and Carers Leeds on the phone at key times when I needed them either to listen to me or help me navigate the spiders web of services and local know-how. In dementia care you feel like you are often set up to fail – but thankfully I had the opportunity to do some training in my time as a carer, I needed support so I searched everywhere to get the information/skills and insights I needed. But it was clear from this gathering of carers that not everyone finds this opportunity, has the time to go seeking it out or realises that it might help. Val Hewison pictured above is the lead at Carers Leeds and she definitely has ‘the carer’s needs’ front of mind. The Carers Leeds team offer training and lots of hard earned know-how. I can’t thank Carers Leeds enough for their support over my six years as a carer – they helped me stay on track. I’d also like to thank Val, for being able to see the needs of Working Carers – I look forward to our continued conversation and future collaborations. A new team of Memory Support Workers are starting their training next week in Leeds and I am delighted to have the opportunity to share my carer story with them and be invited to connect to a growing community of Leeds Dementia Care Know-How for all of us involved in dementia care, whatever our role, across the city. We’ll be stronger together! I recently visited NHS England at Quarry House in Leeds. I was invited by the Corporate Social Responsibility team to take part in one of a series of lunchtime staff events, that they are running as part of World Alzheimer’s Awareness Month. I wasn’t sure what to expect at all… I just knew that my Carer Journey was likely to be helpful to others – a real lived experience and not theory. I was amazed to start very real conversations with the event attendees straight away… two co-workers supporting each other in their separate working carer journeys. One person was working while her sister did the parent care, and one person was the family care co-ordinator and needed more help, information and support. So the reason for me sharing my journey was vindicated before I even made a start. I want to help make other people’s experience of dementia and alzheimer’s care a little bit easier and bring it out of the shadows and into an open space where we can all help each other. After the talk the questions raised showed how much eagerness there was to engage with this subject for both staff juggling care in their working lives and also professionals looking at support services for people with dementia and their carers. What was billed as a 20 minute talk with 10 minutes questions turned into an hour long event with what seemed like an eagerness for lots more. It was evident that it was no small thing to be a carer and to work full-time too. After sharing my story, I was quick to point people to our local support services like Carers Leeds and Leeds Alzheimer’s Society where carers can get their first lines of support. I am now looking at how I can translate my experience into workable helpful tools and interventions to help other carers. So this talk was a really helpful small research event. I will post further progress as my work develops. Thanks again to NHS England, Leeds for inviting me to share my carer journey story. If you are a professional service provider and would be interested to involve me in any of your work in dementia care/carer support, please just drop me a line.